This guide was written by our two experts in Chinese: Aldo Terminiello and Armando Turturici. The first part was written by Aldo, while the second was from Armando. Enjoy the read! In China, translation was of vital importance at key moments in history. For example, in the second century A.D., when Buddhism reached the Middle Kingdom and it was necessary to translate the sacred texts from Sanskrit; in the eighteenth century, when Christian missions (especially the Jesuits) translated the holy texts into Chinese and the key texts of the boundless Chinese literature into Latin in order to get to know the civilization they were trying to convert to Christianity. In the nineteenth century and the first few decades of the twentieth century, China realized it was technologically underdeveloped compared to the rest of the world, and felt the need to import lots of scientific and literary texts, setting off a third great wave of Chinese translation. During the first half of the twentieth century, the translation of Russian revolutionary texts had a great impact and could be considered the fourth period of Chinese translation. As a common factor during these periods, there was a need to import knowledge and make it available to Chinese people in their own language: translations for religious, ideological or cultural purposes, rather practical goals that also reflect the translation theories created during those periods, which were manuals that simply explained “how to translate well”. Urgency of communication nowadays makes the situation is very different: translations are more and more often conducted in both ways, in Chinese and from Chinese. “All you need is Google Translate!” is the answer I got somewhat jokingly when I mentioned the problems I came across when translating Chinese. It can be true: sometimes the automatic translator works really well, like when translating instructions for washing a T-shirt or putting together a piece of furniture. I’m willing to bet that you too have found that at times the translations on packaging or pamphlets from items Made in China are a bit wacky, and the same goes for the famous “fortune cookies”. Most of the times though things aren’t so easy: translating from one language to another is always a complex process, but with Chinese it could be even more difficult than we think. In order to maintain the creativity, appropriateness and readability of the original text, the translator must often make choices, adaptations, additions and cuts: a last step from the translator is transforming simple translation from one language to another into a rewriting, more like an adaptation to a different media than a simple “change of clothes” for the text. This example is perhaps the best fit for the Chinese language: like the cinematographic adaptation of a film can tell the same story, but with images, sounds, movements and lights instead of doing so with words, a written Chinese text – with its characters, “intuitive” structures and rather “debatable” grammatical rules – can be transformed into a written text in a language such as English, where every verb tense has its specific function, each aspect is explained and explainable, every rule is firm even with its exceptions. Essentially there are two fundamental operations when translating: understanding the original text and then rewriting it. During the first phase, it is essential to fully understand what the text’s author means to say, why they have chosen certain words instead of others, what their style is; then it’s time to rewrite the text, trying to “re-dress” those ideas, concepts, stories in a different set of clothes, in a different setting while keeping the substance intact as much as possible. Yan Fu (严复 Yán Fù, 1853–1921) said there are three challenges when translating a text: the first in being faithful to the original text信 (xìn); the second is expressing yourself clearly 达 (dá) and elegantly 雅 (yǎ). In this article we’ll look at the options for a balanced translation, which renders the sense of the original text to the reader, seeking to understand how it’s possible to transmit the original meaning between two different languages and keeping its form and style as much as possible. A sad reality for those who have been learning Chinese, even for many years, is that in every new text there will always be words you’ve never seen before. A good strategy to help in understanding the text is to first identify the words you know: at times this is all that is needed to get an idea of the general meaning of the text and the purpose of the words you don’t know yet. In a Chinese text the characters aren’t normally separated like our words are: this is quite the challenge for beginners, a little less for those who already know a fair amount of characters. Setting aside the classic texts, where there isn’t even any punctuation, these days punctuation is also quite often used rather “arbitrarily” (I hope I’m not the only one who has come across entire paragraphs with only a final period). But what should you look for first? I start with words with a grammatical function such as the “three de” (的、得、地), 了 (le), 过 (guo), the particles 吗 (ma)、吧 (ba)、呢 (ne), frequently used conjunctions and adverbs such as 但是 (dànshì), 可是(kěshì), 而且 (érqiě), 非常 (fēicháng), or 比较 (bǐjiào). Isolating these parts of the text, even circling or highlighting them to separate them from the “blocks” in order to break down the phrases, you will already have a general idea of the structure of the text you’re facing. Numerals are also easy to identify, and often indicate the time in which an action takes place: at times, when at the beginning of a text it says that something has happened “three years ago”, then you know that the whole account is in the past – and you will not find any further indications. An additional difficulty with Chinese is that there aren’t any conjugations and declinations: on one hand this greatly simplifies the grammar, on the other, when translating, there’s an enormous ambiguity to compensate for, since in English one can’t be so “vague” with verb tenses and agreement with the other parts of the phrase. Another trick is to look for repeating characters, which will likely be the key words of the text in question. A basic thing to remember is that in Chinese words don’t have an exclusive grammatical function. The same word can be a verb, adjective, noun or adverb. For example, when in English we find a word that ends in –ing, we can reasonably assume that we’re dealing with a verb (but pudding is a not too tasty kind of dessert). 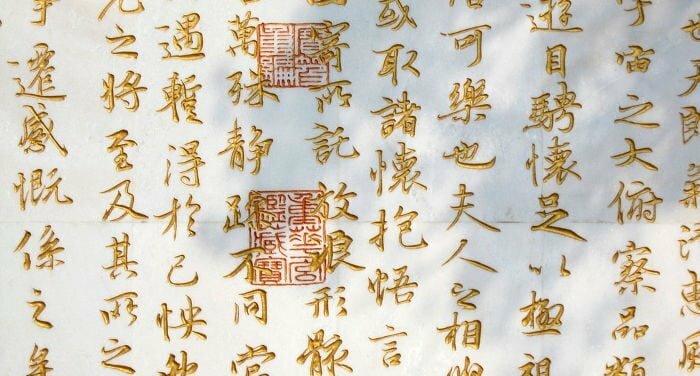 In Chinese there’s no such certainty: rather, one of the basic differences with our own language is that words can often play any grammatical role within a phrase. Here’s a simple example: 好 (hǎo), good/well, is one of the first characters that you learn. You already know that 你好 (nǐ hǎo), which we translate as “hello”, literally means “you (are) well”; 好吃 (hǎochī) is good (to eat), 好看 (hǎokàn) is beautiful (“good to see”), 好玩儿 (hǎowánr) means amusing (“good to play”), but in an expression such as 好贵啊 (hǎo guì a!) it instead means “how much”, “a lot”: wow, it costs so much! If instead we say 这个问题好回答 (zhège wèntí hǎo huídá), which means “this is an easy question to answer”, then 好 means “what one does easily”, but in a phrase like 我做好了 (wǒ zuòhǎo le) expresses the completion of an action (“I finished”, literally “I did it with a good result”). Still, in a phrase like 他好表现自己 (tā hào biǎoxiàn zìjǐ), 好 is pronounced in the fourth tone and is a verb – to love: “he loves to show off”. Lastly (but only so that we don’t go on too long about this), it could be part of other words, like 爱好 (àihào), hobby, 好像 (hǎoxiàng), to seem, 好处 (hǎochu), advantage, and so on. All this is to say that there are two aspects to understand with every word: the function and the meaning. Each character/word can have many meanings (some of which can even be contradictory) and serve multiple functions within a text, so it’s helpful to use the more common and “precise” words to be able to understand which of the functions the “complicated” words serve in the text being translated and which is the most suitable meaning. Returning to our “search”: in English proper names are characterized by capital letters, while in Chinese there’s usually nothing like that, but often three characters which don’t have any meaning connection among themselves are usually a name, while multiple characters combined into an absurd meaning will likely be a transliteration of a foreign name. Once you identify the words you know, all you have to do is check a dictionary (or simply Google Translate or Pleco, a very useful Chinese app) and you’ll find the “missing words”. It’s best to note down, maybe on the text itself if you have a printed copy, the most applicable meanings and possible translations, so you will be able to choose the best-suited word in English without looking them up again once you have a better idea of the whole meaning. At times some words composed of multiple characters will not be in the dictionaries because they’re too new or have been coined by the author: in those cases, it’s often a good idea to just look at the characters separately to be able to figure out the meaning of the entire word. If the text has a title, being able to translate it can be very useful, but often, since Chinese is a rather “cryptic” language, it isn’t immediately understandable and you’ll have to read at least the first paragraph to be able to interpret it. A very useful tip is to not give up at the first sign of difficulty: if you can’t translate a phrase, often you just need to move on to the next sentence to understand the preceding one. A last bit of advice is to consult with teachers and Chinese friends who can help us if we can’t figure out the meaning of certain expressions. It’s often happened that I wasn’t able to understand a text because I had never read a certain book or was unaware of a proverb widely known in China which for some reason I hadn’t learned yet. Obviously, the internet and especially Baidu, with its immense database of phrases and possible examples, can be a great help: if you can’t understand what a word means in our context, just look for another example or sentence and you’ll likely be able to understand the meaning of the expression based in another phrase that contains it! Once you understand the meaning of the text, which in my case will be a mess of notes, arrows and possible meanings, we can then move on to the next phase! What must be done when rewriting a text in your own language? According to Yan Fu, it is by staying faithful to the original text, expressing it clearly and with elegance. Often we see translated texts “built” according to the structure of the original language, not written in “original” English or seemingly “foreign”: this is because at times the translator feels too attached to the original text and can’t move away from it, forgetting that, true, their task is to translate, but to also to “rewrite” into a language that is pleasant to read! A basic rule I saw in the book “Thinking Chinese Translation” by Valerie Pellatt and Eric T. Liu is that “there should be no ‘can’t’ for the translator”: simply put, the translator is free to do anything! Let’s look in detail at what can be done in order to make the translation as pleasant to read as possible. The translator should feel free to recompose the phrase, moving for example something that in Chinese is put at the end of the sentence to the beginning, if in English it is required or if it is simply clearer, easier to read or more elegant to do so. Obviously, this isn’t just limited to the parts of a sentence: if a phrase is too long, it can be broken up into smaller pieces. On the other hand, if there’s a bunch of small phrases they can be combined into a more complex phrase if we think that in English “we would say it like that”. This isn’t just a possibility: anyone who has ever translated from Chinese has done it, even without realizing it. We have added articles, prepositions, endings and verb tenses that are not there in Chinese because they have to be there in English; added subjects or verbs that were implied in the original text; we’ve added additional explanations that weren’t in the text we’re translating (at times adding a note), because they are necessary for the English reader. At the same time, we’ve removed, for example, verbs or adjectives that have been doubled, because there’s no need to repeat them in English, or we’ve substituted them with other expressions that give the same sense of the doubling. For example the phrase 去看看 (wǒ qù kànkan) can be translated as “I’ll go see it”. At the same time we mercilessly take away all expressions that would “burden” the reading, at times even entire portions of the text: if you think that the English reader doesn’t need it, just cut it out! Often, without realizing it, we have also “lengthened” the original phrases to explain them better or we’ve contracted them because it isn’t necessary in English to dwell too much on things that perhaps have already been said before. This isn’t a matter of adding or removing but simply “extending” or “contracting” something already there, in the original text or, in one word, “adapting” it. The translator is also free to substitute original expressions with other more correct ones in the target language, as long as it doesn’t at all change what the author intended to say in the original text. Generally, you should aim for the functional (or practical) equivalent, which means finding an expression that corresponds to what should be said in the same situation, using your own language. In the same way 吃饭了吗? (chīfàn le ma?) quite often doesn’t literally mean “have you eaten?”, but simply “how’s it going?”, “everything ok?”. The author has the possibility, need and responsibility to choose. It’s often not possible to render all meanings of a word and it is necessary to choose one; we can find various synonyms for the same term, and it’s up to us to choose the one that’s best suited; we can change a phrase either greatly or slightly, depending on what effect we want to give, thereby choosing to also make changes on the style. There’s a direct and equivalent translation of what we’re looking to translate: no problem and no headache. There’s a similar though not entirely equivalent expression, which perhaps better renders the original sense while maintaining, up to a certain point, the form that the author used (for example, a verb that’s similar to the original verb but also has another meaning that doesn’t completely correspond). There’s a bit to think about here. There is no equivalent expression. What can we do? We have a few options. We can paraphrase, changing the entire structure of the phrase and text; translate it literally, then add an explanation (in the text, in parenthesis or in a note) to help the reader understand the text; lastly, we can make a loose translation, twisting the text from its original form while trying to keep its meaning..
Let’s look at an example of a rather complicated translation of a proverb, noting how 正月十五贴门神—晚了半月 (Zhēngyuè shíwǔ tiē ménshén—wǎnle bànyuè) can be translated. 1. Literal translation: (it is like) hanging up images of guardian divinities on the fifteenth day of the first lunar month, half a month late. 2. Substitution: with a different proverb in English, it could be translated as “it’s like shutting the door after the horse had bolted”. 3. Annotated translation: it is like hanging up images of guardian deities on the fifteenth day of the first lunar month, half a month later (note: according to Chinese tradition, images of the two guardian deities were hung on the doors of a house on the day of the lunar new year to protect the habitation in the year to come). 4. Explanatory translation: it’s too late, like hanging images of the guardian deities so as to protect the house during the coming year on the fifteenth day of the lunar month instead of on New Year’s. 5. Loose translation: it’s too late now. Each option has its own consequences; substitution maintains the characteristic of “metaphoric language”, finding a functional equivalent of the Chinese expression; while changing the metaphorical image causes a detachment from what the author has written, which in the case of translating a literary text might not be a good choice, while in other cases (for example, in a tourist guide or a non-literary text), it might not be a problem. The noticeable limit of a literal translation is the need for the reader to have specific knowledge in order to understand it; it could be a good choice if it’s assumed that the reader knows the necessary information needed to understand the meaning of the text (for example if it has already been explained before or the readers are experts on Chinese culture). An annotated translation allows you to keep the text as close as possible to the original, making available for the reader all the information necessary for a correct understanding; it has the advantage of not “breaking up” the reading if the reader doesn’t need the explanation and keeping it handy in case further explanation is needed. Translation with explanation extends the text, but provides all necessary information during the reading, making it more fluent. It could be a problem if one does not want to expand the text or if it’s simply not possible to do so, or if the added information “makes it heavier” somehow. A loose translation cuts out the metaphoric element and simply explains the meaning; it could be a good choice in non-literary texts where the imagery used isn’t important, but only what is meant to be communicated. Obviously the text to be translated determines the option of how it’s best to translate it: in a novel we would give preference to the author’s style, letting the Chinese culture shine through rather than “adapting” the text too much; for a travel guide, we could instead opt for the functional equivalent and simply say things as we would say them in English. The translator is free to do everything we mentioned, but must keep in mind that their task is to stay faithful to the sense of the original text, as well as the style: this means that it isn’t enough to rewrite what the original author wrote, but one must seek, with certain precautions, to also render the way in which it was written. After reading Aldo’s part, now it’s mine, Armando’s turn. Enjoy the read! Translating from any language is without a doubt a difficult task that requires notable patience and strength of will. A keyword that is very important for any translator is “read”: before starting any translation, you need to read the original text attentively two or three times. You need to read carefully and patiently, and to do so out loud to bring out eventual sounds and be able to drop into the various atmospheres. Reading out loud is fundamental! When reading out load we turn up our nose at how we wrote something, it means that something needs to be changed. A good translator knows the source language well (Chinese, for example) and must know the target language even better, which will ideally be their mother tongue. For this reason, I recommend that you equip yourself with such indispensable tools such as grammar books, a dictionary and so on. Moreover, the translator must be patient in another respect: since there are no identical considerations between different languages, the translator must be willing to bargain. Translation forces you to choose. Translation is not “to say the same thing in another language” but as Umberto Eco says, translation is “saying almost the same thing. Rather, at times, betraying the text is the only way to stay faithful to it. In addition, a translator must know that each language can have various forms: you could use a high, low, dignified, prosaic, formal, informal, colloquial, bombastic, plain, literary, or vulgar style, and so on. Therefore, a translator must constantly keep up to date and have the tools they need to do their best work. Tools are indispensable since no translator could ever have an all-encompassing knowledge. In Chinese, the verb translate uses the character 翻 (fan) “to overturn, to reverse”, but also means “to multiply”. What I wrote above is even more valid for Chinese: you need to reverse or overturn a Chinese text to produce an adequate translation. Maybe what I’m about to say is blasphemy but… if you really can’t understand the meaning of a phrase, don’t scorn Google Translator or Baidu Translator: these two will at least give you a general idea of the phrase! To conclude, ask somebody Chinese for help and there will always be a benefit.